With appreciation for all that John and Yvonne have done. He will be missed. John gave much of his time as a volunteer helping me [ and many others ] with information and encouragement throughout the long open heart surgery recovery process. Ash was a colleague and friend for over five decades. We join the many folks who will be giving to the RCH Foundation in support of his legacy, a selfless guy who helped so many others in a life well-lived. In memory of long time friend and former co-worker, John Asbridge. Happy to support just one of John's many great legacies. He is missed. I did not know John Ashbridge at all, but the critical services that the Code Blue Team provides to the patients at RCH is invaluable. Also, many years ago I intended to pledge a financial donation to RCH Foundation for medical equipment and, due to unforeseen circumstances, I was not able to follow-through on that financial pledge. I would like to follow-through now on that commitment I made years ago. I had the pleasure of working with John - a wonderful Man who was a joy to know-Left us far too early. John was a friend of ours and we are proud to contribute to his legacy. He was a wonderful individual. I meet him through hockey announcing. Royal Columbian Hospital Foundation is grateful for the opportunity to create a special fund in memory of John Ashbridge, who served on our Board of Directors for a full term, including a period as Vice Chair. John was very generous with his time and talents and put his legendary voice behind many of our projects. More importantly, he fully put his heart into his work in support of Royal Columbian. Donations to the fund will allow the Foundation to support the needs of the hospital, including its Code Blue Team. This specialized group, composed of health care professionals, rush to the location of distressed patients at the hospital and start immediate resuscitative efforts. 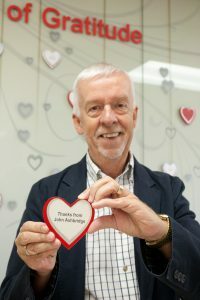 Thank you for helping to honour the memory of John Ashbridge by supporting this fund. When time is critical and a patient requires immediate resuscitation, every second counts. Royal Columbian Hospital’s Code Blue Team is a specialized group, composed of health care professionals, that rush to the location of distressed patients in the hospital and start immediate resuscitative efforts. Most often, the Code Blue Team responds to respiratory arrests or cardiac arrests. The survival of a patient in distress can depend on the team’s quick actions. Time is critical, and so is being prepared for a real-life code blue, knowing what life-saving equipment is available and where it is located. The research shows that CPR compressions are instrumental in saving lives during an arrest. Health care providers benefit from practicing their skills during realistic ‘mock’ scenarios and reviewing the results. The ongoing training keeps them sharp and strengthens the team’s communication and familiarity. As a hospital that cares for some of the province’s most seriously ill and injured patients, as well as being BC’s busiest cardiac care centre, Royal Columbian’s Code Blue Team is an integral component of the exceptional care provided here.